Dating back to 1876 when Alexander Graham Bell assigns 75% of its patent to his father Melville Bell to startup a Canadian telephone business. Bell Canada was born and 135 years later, Bell is still a thriving business. Bell Alliant is actually an income trust trading under BA for anyone more interested in the telecommunication service industry. It has a dividend yield of 7.05% compared with BCE's yield of 5.29%. "BCE is setting a clear dividend policy with a target dividend payout of 65% to 75% of Adjusted EPS that provides sufficient financial flexibility to continue investing in the business while growing returns to shareholders,"
BCE has practically recovered from the financial market crash as you can see in the 5 year graph below. It's currently trading near the top of its 52-week chart but it still has room to match its high of 2007. BCE's dividend graphs isn't a dividend aristocrat graph by no means. Aside from the 2008 trouble, it's relatively flat. It's a very different graph when compared with Rogers Communications or Shaw Communications. The main difference is that BCE has paid dividends since 1949. That's 62 years of dividend history. Such consistency in paying dividends for that long shows the commitment from the management team to its shareholders. The payout ratio is relatively in line with their guidance of paying between 65%-75% of their earnings. 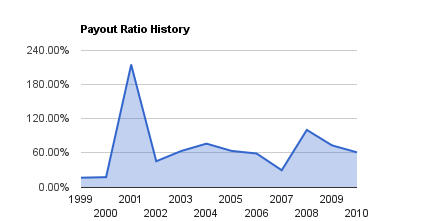 2008 was above target and they also reduced the number of payments during that time. You can see in the 5 year graph above that they only had 2 payments. In the dividend growth graph above, the drop represents their missed quarterly dividends. A bump in the road can be overlooked as long as it doesn't turn into a bumpy ride. We can see 2 bumps over the past 2 years. 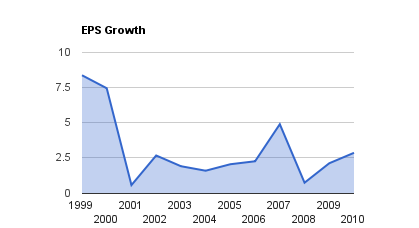 The EPS growth below doesn't really show any growth. Another interesting view... I also noticed that from their revenues flatlining between $17 and $19 billions over the past years. They increased their profits by reducing costs but it would be nice to see more customer acquisitions. The 2010 Olympics did help them but they need to be able to retain them for the long term. Over the past 10 years, BCE has seen its profit increase while their revenues have been relatively flat bouncing between $17 and $19 billions. The transformation in the wireless sector may impact them more than the other telecoms as they still earn a significant amount of revenu from their land line business. They are upgrading internet infrastructure to leverage fiber optic but it is costly. I don't believe we are going to see any major upswing in their stock but a healthy dividend along with a steady growth should reward investors. They are strong in both Ontario and Quebec which is where most of the population is giving them access to more customers without needing to expend too far. AT&T may be a better holdings if you don't mind having a US holdings. 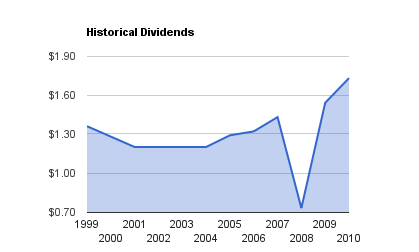 It is a true dividend aristocrates with 25 years of dividend growth and a yield of 5.64%.